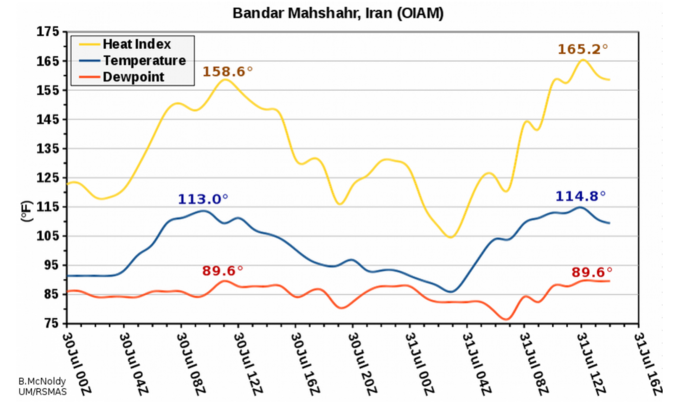 In the Iranian city of Bandar Mahshahr, temperatures just soared to what feels like 165 degrees Fahrenheit, factoring in the humidity. The air temperature clocked in at 115 degrees with a dew point of 90. This is close to the highest temperature ever recorded of 178 degrees in Dhahran, Saudi Arabia in 2003. The city of Bandar Mahshahr sits close to the Persian Gulf, where waters reach over 90 degrees, causing stifling humidity when winds blow inland. The Middle East is currently experiencing a devastating heat wave. On Thursday, Baghdad recorded temperatures of 122 degrees. Iraq's current heat wave spells trouble for millions of people who have been displaced due to violence. Lack of water and electricity led to a protest in the southern city of Basrah, where one person died. 2015 has been named the hottest year ever recorded. Heat waves in India and parts of Europe have made headlines in recent months.